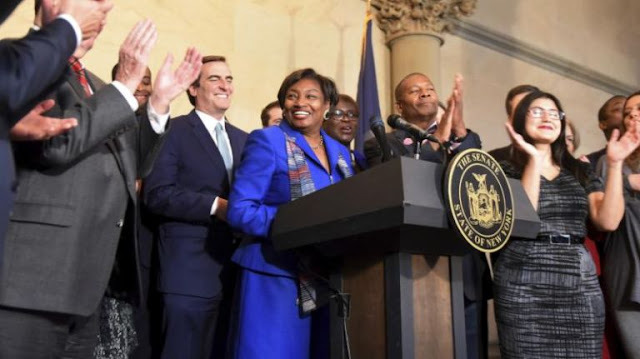 New York State Senate Democrats announced they have voted Andrea Stewart-Cousins (D–Yonkers) as the new Senate majority leader, making her the first woman to lead a majority conference in the state legislature. Gov. Andrew Cuomo on Monday issued a statement congratulating Stewart-Cousins on her election. “Since the beginning of her career in public service, [State Senate Majority] Leader Stewart-Cousins has always been a trailblazer. From being the first African-American woman to serve as director of community affairs in the City of Yonkers, to authoring and passing landmark legislation in the Westchester County Legislature to strengthen gun laws and protect human rights, to taking on local property taxes and fighting for our communities in the State Senate, she is a proven leader and a skilled legislator,” Cuomo said in the statement. Her colleagues elected Stewart-Cousins to serve as leader of the Senate Democratic Conference in December 2012, which was in the minority at the time, becoming the first female leader of a legislative conference in New York, per the New York State Senate website. She was first elected to the state Senate in 2006 and currently represents Greenburgh, a portion of White Plains, part of New Rochelle, and parts of Yonkers and Scarsdale, the website says.